Uniform insignia for Confederate officers was less precise than that of their foes, largely because the Rebel Congress authorized new grades of commissions without getting around to specifying suitable badges of rank. 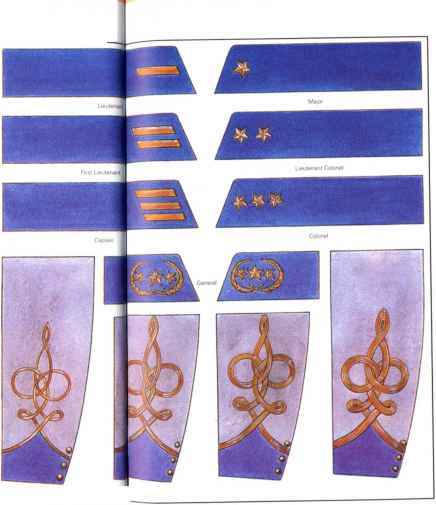 Badges of rank were worn on the collar and, in comparison with the Union forces, the Confederates used one bar for a second lieutenant, two bars for a first lieutenant and three bars for a captain, but then used stars for field officers: one star - major; two stars -lieutenant colonel; and three stars for a full colonel. Above that, however, all four grades of general officer -brigadier general, major general, lieutenant general, and full general -wore the same sleeve and collar insignia, the latter consisting of three stars surrounded by a wreath. The situation was made even more complicated because some high-ranking general officers, notably Robert E. Lee and Joseph E. Johnston, often wore the insignia of a full colonel for no apparent reason. At least the Confederates did not further complicate matters by resorting to the cumbersome brevet system of the Union Army. Striping on their kepis was also officially specified for rank, but many generals and lesser officers eschewed the kepi in favor of the more practical slouch or round-brimmed hat. Branch facing colors were the same as those used in the Union service. Below: Unidentified Confederate officers early in the war. Four years later their uniforms would be in tatters. What are four confederate ranks? What color did the confederates wear? 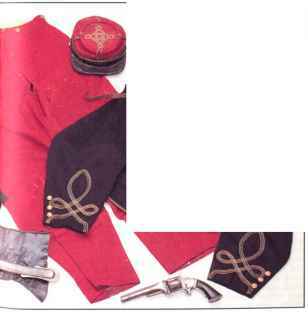 What did the captain of the confederate uniforms? 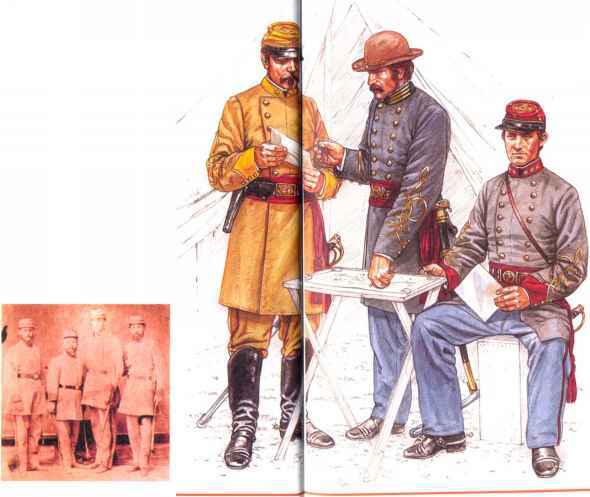 What the different ranks of confederate uniforms?